A Scheme to Keep BiH Out Indefinitely? 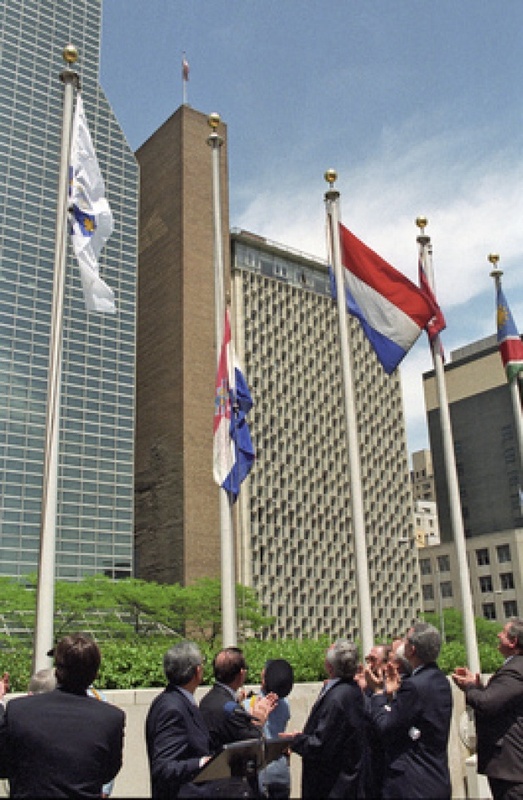 Friday, May 22, 1992 Bosnia & Herzegovina’s flag was raised for the first time at the United Nations as a member of the family of states. However, only a week earlier this was not a certainty. There was a design to keep Bosnia & Herzegovina (BiH) from being admitted along Croatia and Slovenia, perhaps for the moment or forever. Admission to the UN was both symbolic of sovereignty and territorial integrity as well as substantive to legal rights as well as obligations under the UN Charter and international law. May 15, 1992, I received a call from Ambassador Engin Ansay, Representative of the Organization of Islamic Cooperation (OIC) to the UN. He told me that he was starting to find out that something strange was underway regarding BiH’s application for admission – he could not get a response on its status from the UN Secretary’s Office. President Izetbegovic had directly faxed a letter of application for admission. I quickly called the UNSG’s office and sought to find if there was any issue. One conversation after another, no one wanted to either admit that the application was being processed or even that it had been officially received. As an attorney and investment banker accustomed to dealing with legalities even this was rather odd, as no one would acknowledge either physical possession or status even though we knew it had been received. I had an uncomfortable feeling. As I pressed further, confronted an adviser to UNSG Boutros Boutros Ghali for a second time and after more than two hours of phone inquiries, the application’s legal status was raised as only a potential problem as it had been faxed rather than delivered with original signature. Of course Sarajevo was already besieged. Direct mail was impossible, and faxed copy was legally effective regardless. As an attorney, I may have been inclined to enter into a protracted debate. However, legality also necessitated that the application be submitted a week in advance, and both Croatia and Slovenia were scheduled for admission the following Friday-May 22, 1992. I recognized that perhaps there was a strategy to run the clock out on BiH, and thus indefinitely put-off the country’s admission to the UN. Fortunately Dr. Haris Silajdzic had just returned to New York. I quickly drafted a new application letter, and Dr. Silajdzic as Foreign Minister signed it. It was already 5:00 PM, and I called ahead to the UN Secretary General’s Office and informed them that we were on our way regarding an urgent matter, without further specifying our purpose. Fortunately, besides my personal business office as then still informal BiH Representative office, we also had the use of Austria’s Mission to the UN, which was immediately across the street. In the next 20 minutes Dr. Silajdzic and I were riding to the 38th Floor of the UN Building with a rather ruffled UN Security Guard. A surprised and perhaps bit annoyed assistant for the Secretary General met us at the elevator. I simply handed to her the one page letter and informed her that, “this was the Republic of Bosnia & Herzegovina’s application for UN Membership complete with all commitment and requirements.” Dr. Silajdzic and I then simply turned around and went back down on the elevator, a sense of satisfaction that we probably had overcome an intentional obstacle or two. However, cognizant of the manipulations already evidenced and perhaps others that may await us, Dr. Silajdzic and I went to see Ambassador Samir Shihabi, then the President of the UN General Assembly. He had also noted that Croatia’s and Slovenia’s applications seemed to be winding through the process, but BiH was somewhere in limbo – in effect it was to become a subject of debate as to legality of a faxed letter and signature. This would serve the purpose of this who had wanted to put-off BiH application without them ever having to show their hand but only engage in an indefinite legal inquiry/debate. However, now with an original signature application, no need for either analysis of legality or delay for the discussion/debate. We were still weary that some other reason/pretext for deferring BiH’s membership would be raised. Ambassador Samir Shihabi proved his courage and commitment to BiH. We agreed that he would not call for a UN General Assembly Session to Admit Croatia and/or Slovenia without BiH also included. Almost overlooked though were just the fundamental considerations of protocol that may in time translate to substance. Dr. Silajdzic left New York for the week before the admission ceremony. In consultation with Sarajevo, we decided that the plaque for BiH would only state “Bosnia and Herzegovina.” There was some consideration for “Bosna and Hercegovina” or just “Bosna,” but in the end as Croatia and Slovenia for UN purposes, we employed the “Americanized” name and inclusive of all. There was also no flag. UN protocol did not know how to even sew it, and it was too late anyway. 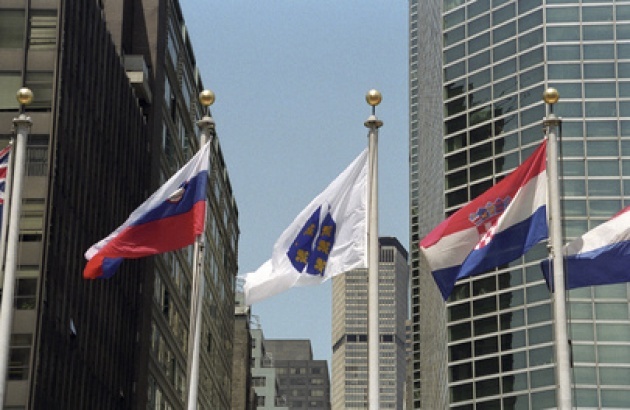 A Bosnian-American patriot and one of few of the Diaspora in New York City, Dika Lemes, helped deliver the new symbol of the country for that May 22, 1992 ceremony. The flag was just a bit smaller than official protocol size, and a closer examination would show that it was stitched by hand. However, it was this flag that reached into a bright, blue early summer sky. However, the comfort was only for a moment, as I believe all of us who had the honor to be there were cognizant of the horror that was engulfing Bosnia & Herzegovina. There was no celebration dinner, but only sense of urgency and job to be done. Sarajevo was only the most visible of BiH’s bleeding wounds, while from the Drina River to Posovina to Bosanska Krajina to Mostar and Herzegovina, there was no one to hear and report the crimes or to tell the victims of this small victory of Bosnia & Herzegovina. 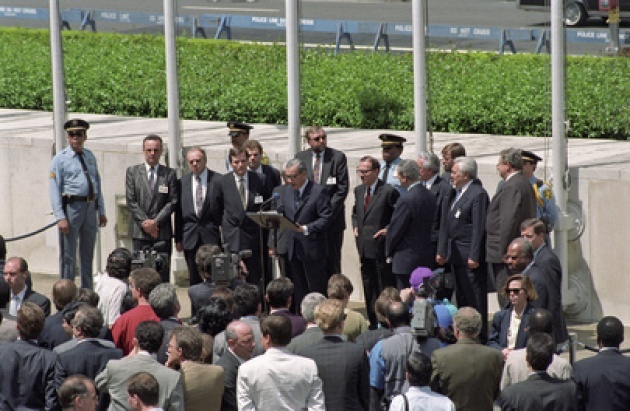 See our Film Report of Bosnia & Herzegovina Admission & Flag Raising - May 22, 1992. 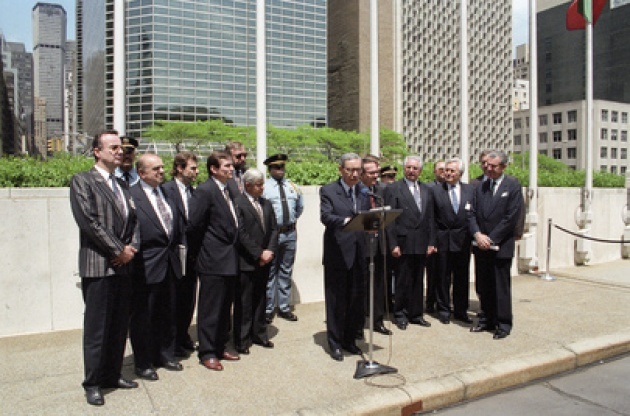 ---This is the third in series of short articles covering the period to Bosnia & Herzegovina’s admission to the United Nations on May 22, 1992.